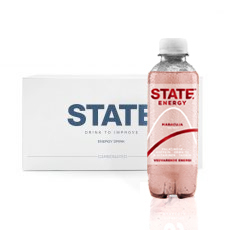 STATE — the innovative solution to improving performance. Based on extensive development in collaboration with a wide range of experts and top performers, STATE provides athletes and active people around the world with a high and longer lasting level of energy. STATE delivers longer lasting energy with a unique combination of caffeine, green tea, niacin, taurine, B-vitamins and Palatinose. Lightly carbonated with a balanced and natural taste of lime/orange. Use before or during performances. High caffeine content. Not recommended for children or pregnant or breast-feeding women (32 mg/100 ml). *DRI = Daily Reference Intake. Carbonated water, fructose, isomaltulose**, acid (E330, E331, E338), taurine (0,4%), natural flavous, green tea extract, preservatives (E202, E211), caffeine (0,03%), vitamins (niacin, pantothenic acid, vitamin B6, vitamin B12), colour (E133). **Isomaltulose is a source of glucose and fructose.